Looking for Strategic Planning That Actually Works, Sarai’s best-selling book? Do you do this normal nonprofit thing where everything that comes up for you to do feels utterly urgent? Where you have so many plates spinning that you can’t possibly imagine stopping any of them, ever, for any reason…everything is a priority, so, in effect, nothing is a priority? You’re not the only one. It’s just a challenging thing that comes with the territory…unless…unless it doesn’t. GET FOCUSED TO GET RESULTS! We help nonprofits drill down into the things that really matter so they can not only create a strategic plan, but also execute it. Revolutionary, right?? It’s fast, affordable, and, amazingly, it works. 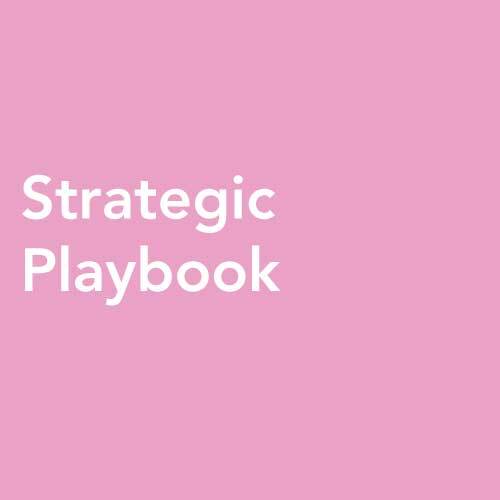 The Strategic Playbook works in rolling 90-day cycles. We work with you for a year (once a quarter) to help you stay focused so you can get results that matter. It’s not easy to cut through the noise to hear the real music when everything around you is demanding your attention. That’s why it helps to have someone come in to help you write your own score. We come to you to create a 90-day plan and 3-year outlook. You will surprise yourself at how easily you can prioritize and make choices so you can focus on what really matters by the end of our 6-hour in-person workshop. You will decide on a theme for the coming 90 days, assign accountabilities to projects, and get super focused on the things that will move your mission forward significantly. We send you your plan. Then, you go and do the work. We come back (or do a call) for 90-180 minutes (depending on the complexity and depth of your plan). We look back to review what got done, what didn’t get done, and what that means for your organization. We look forward to decide on the top priority theme for the next 90 days, decide which projects are critical, and who will do what. We meet together once more in person to look back and fully debrief that past year, celebrate successes, bring the best forward, and leave the rest behind. We create a new plan, mark progress on the three-year outlook, and align on forward progress. 90-day rounds of action are recognized widely as the most effective way to move an organization forward quickly and effectively. If you pick the things that matter most, you make progress you will hardly believe. It’s a simple thing - the truth is, we try to do too much with too little in the nonprofit sector, which gets everybody running around like jumping beans trying to do everything. It leaves staff, volunteers, and board members feeling exhausted, wired, unfocused, and, ultimately, burned out and hopeless in the long-run. Don’t do that! It sounds scary! But it isn’t. We promise you will start to see progress, and that momentum will feed you and your efforts. You will see changes you didn’t think you’d ever see. You will learn how to move things forward, get things done, and make magic happen! We do all this with you - work with you for a year, host multiple in-person and remote facilitated sessions, and update your rolling 90-day playbook all for $9500 a year. Screaming deal. What’s it worth to your organization to make actual progress on real strategy? My guess is a whole lot more than $9500. You get access to something that will completely change the game for you - and outcomes that are priceless for your mission. Not Ready for a Call? Send a note instead. Thank you! We’ll be in touch soon! If you don’t hear back within a day or two, please email me directly at sarai@leannonprofit.com. I have an inbox filter that is sometimes too effective!